Born in 1970s when China was in economic reform and opening-up, Zhu Yiqing and Xue Yongjun have seen the invasion of western cultures and capitalism values, the prevailing of Japanese cartoon culture as well as the significant influence of computers and Internet on China. All those historical changes have inspired them with deep thinking towards art, inspiring them to study on modern cultural collision from the view of artists and finally choosing the traditional Chinese seal as the medium of creation. 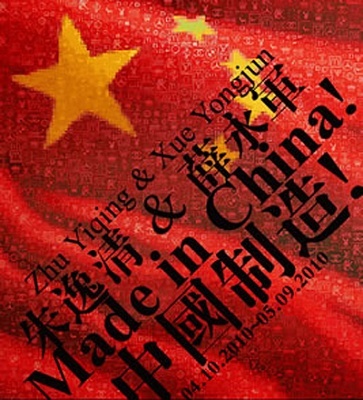 The subjects of Zhu and Xue’s creations mainly cover three aspects including the political images of national flag and politicians, traditional cultural images of classical paintings both eastern and western as well as the popular and consumption cultural images of the idol stars and products logos. Zhu and Xue with their artworks show a strong sense of duality on the selection of subjects, the usage of medium and skills and the formal expression, trying to eliminate the boundaries between the east and the west, the native and the foreign, the traditional and the modern, the handmade and the machinery as well as the perspective and the plane, thus creating any possible balance among those conflicts or contradictions and outlining the new image painting of digital era. The concept and techniques in Zhu and Xue’s artworks, showing their mastership towards the particular cultural identity of China, marks them a distinct and special place in world of Asian contemporary art.